I don't like the Twilight much, but I think we can blame the source material for that one. The rest are excellent, though. Is that Fordo I see with the Spider Droid. I must agree, the Twilight looks strange. As in stranger than from the show. The wing (is it?) seems to jut out and ruin the whole thing. The Republic Fighter tank looks cool. I think the front bit is a bit pointy, but the regular clone is a plus. I hope that it has a couple more figs. Nice detail though. The gunship could do with a bit of SNOT, but the design is pretty good. I hope there is more to is than just a circle with a few blue bits on thought. Any ideas on figs for this? Once again, the Spider Droid is a bit too blocky, but the figs and overall coolness of the thing make it great. All of them are good. Yes, the Twilight isn't all that great, but they look awesome and hopefully will fill out the �30-�50 gap in the Clone Wars line. The twilight I'm not interested in at all. I'm abit disapointed with the Sabre Tank, it's really stubby. But if I have room I will still get it because I love the actual ship. 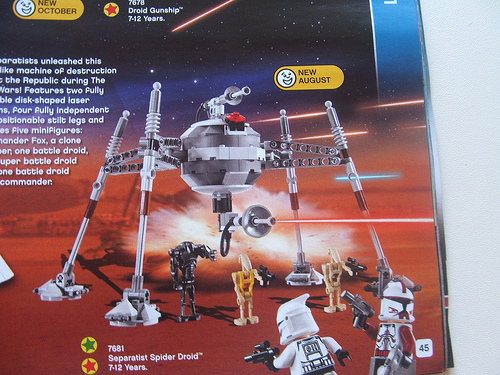 And the Spider Droid is also very cool, and I'll get this too. Yea I will be getting all of these when they come out. Took me a second to figure out what was putting me off on The Twilight. Personally, the front of the ship (cockpit area), is waaay off. Not nearly as smooth as it should be and some of the details don't seem right. I am using this as a reference. Still, all in all, very good looking sets. Woah - I'd not seen the ship still before. I think it looks much more cool. Shame the set doesn't reflect that. The Twilight unfortunately seems to have all the awkwardness of a B-wing without any of its coolness. I blame the source material--clearly they were trying to recreate the asymetrical glory of the Millenium Falcon and failed. The other sets look nice though. The Spider Droid in particular looks like it might be reasonably cheap and yet it still looks fairly accurate. I'm sure my boys will love the tank. With the Death Star arriving at Christmas at the Crusader domicile, I'm very glad some less expensive sets can help fill out the bottom of the tree. I'm still not 100% sure how I can persuade Mrs. Crusader that we need both a gunship and a Death Star. The Twilight is a downright ugly ship. It does look like a B-wing mixed with a house. The tank looks a bit too tall from playing SW Battlefront, but I suppose I could mod it as I see fit. The spider droid is a nice continuation of the hailfire and other droid out now, and with the droid gunship looks neat as well. Now we just need some sets to better flesh out the Rebel Alliance LEGO representation. I might get a few Spider droids, but the rest are easy to pass up. 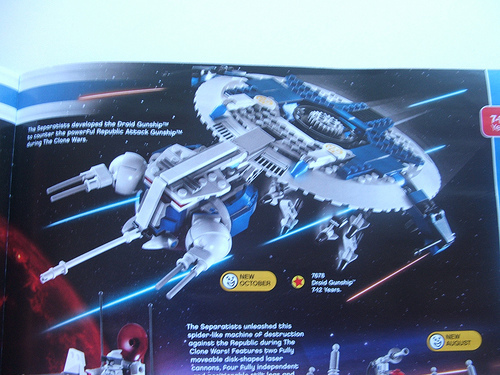 Wow, they are going all out with the clone wars sets....hmm....might need to get these too! Can't wait for clearer pictures! While these sets do look pretty cool. I'm not really sold on them yet. I only say that b/c it's material that's from the Clone Wars cartoon and not the first 6 movies. I don't think I'll be a completist on the latest few waves. These sets all look really good! The only thing that gets me is that the TX-130 and Droid Gunship are coming out in October. But oh well - more time to save up for them. Well, captian REX should be pleased that we can talk about these now. I haven't much liked the look of any of the Clone Wars sets that have been anounced recently. Unfortunately, it's the same with these. If the price is good on the gunship and the spider droid, I might buy it, but chances are I'll be saving my money for 10188. Apart from the Twilight, these look very nice. TX-130S is the one I'm looking most forward to, mostly because it has most regular clones (most likely, at least). HSD wouldn't be bad, either. The Republic Fighter tank looks cool. -- I hope that it has a couple more figs. Well, the text next to the picture says "[Clo]ne troopers" , so there'll be at least two of them. Two would be pretty reasonable number, for - although the tank really has a crew of three - it holds only two in the Battlefront series. These all look pretty sweet. Im definatly going to try to get all of them but the twilight is last on my list. Yah i think that there will be a gunner and a pilot just like in battlefront. The only thing I recognize is the spider droid. You don't remember the Droid Gunship from Episode III? I don't think anyone would deny their existance, just tell you that you can't talk about them here. Unless the figures and the price of the Twilight and the tank really appeal to me, I wont touch them, they are ugly and I don't think were designed very well. I'm also put off by the large amount of stickers covering the tank. I must say that the Droid Gunship looks excellent, it looks to be an interesting build, and seems very accurate to the film. If anything, that red clone seems to be the biggest attraction of the Spider Droid set, I might get this, it doesn't look too terrible, and I doubt the price will be that high. And REX, stop being a jerk just because we abide by the rules here. Is that...captain fordo in the homing spider droid set. Oh my god...please let it be! Edit: Dash away my hopes again...it seems that on the text in the picture says it has some "Commander Fox" character. Oh well I'll pretend he's Fordo . I actually think the tank looks pretty cool...plus the spider droid set looks awesome just by the clones alone. I've only gotten 1 set for retail price in the last 1-2 years, but honestly...that might change. The Droid Gunship is definitely my favorite of this wave. It looks to be both well put together and accurate. The Homing Spider Droid is a close second. I always liked this one since it's a great homage to classic Sci-fi designs. Nice to see it in LEGO form. I'm a little disappointed that there appears to be a third Super Battle Droid color, though. The lack of continuity among those figs is off-putting. 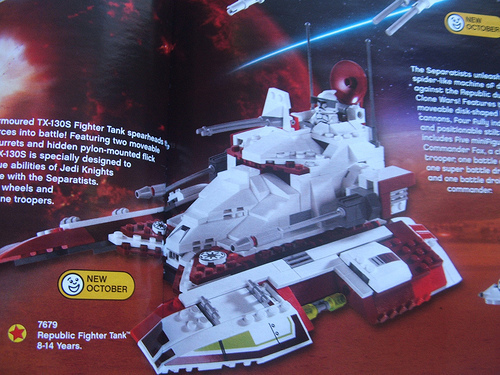 The Fighter Tank is a bit too clunky in the LEGO version and the Twilight is too clunky in both the source material and the LEGO version for my tastes. However, being a completist, I'll save those for later instead of skipping them completely. Any ideas on how much these are going to cost? B:It is hands down my favorite SW vehicle. 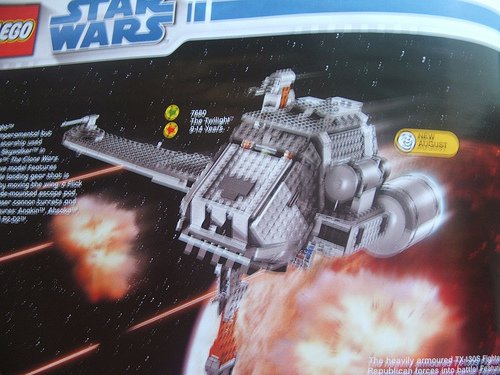 Yeah I agree, the head of the Droid Gunship looks a little bit boxy. And the twilight looks like someone took an AT-AP head and glued some B-wing wings to it. I'll definitely be picking up the Homing Spider droid (The Fordo-esque clone is enough of an insentive for me). And I may pick up the TX-130, but I doubt it. wanna by them all! Unfortunately my liking for star wars has faded. and these sets don't appeal to me much.